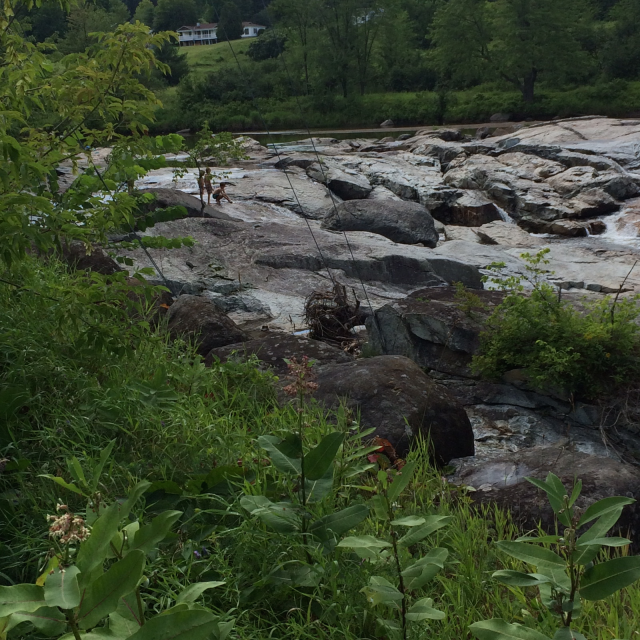 8/3/2016 Editor's note: When thinking about swimming holes in the Whiteface Region this favorite spot always comes to mind. We hope you enjoy this blog from the archives — we'll have to check back with blogger Chelsea to see if she managed to take a dip in the rapids this summer! Being new to the Adirondacks, I’m excited to learn about and experience the many different outdoor activities that come with living in a mountain area, especially since where I’m originally from is actually at sea level! Unfortunately, I’m also coming off a knee surgery (ACL repair) that will severely limit my ability to participate in those activities for the next several months. I was itching to find a place to go that would give me the “Adirondack” experience without the strenuous hike that many other popular destinations require. I also wanted something that could be accomplished in just a few hours, since my boyfriend and I don’t always have a whole day to explore, or sometimes we’re just looking for someplace to go to relax after a long day. 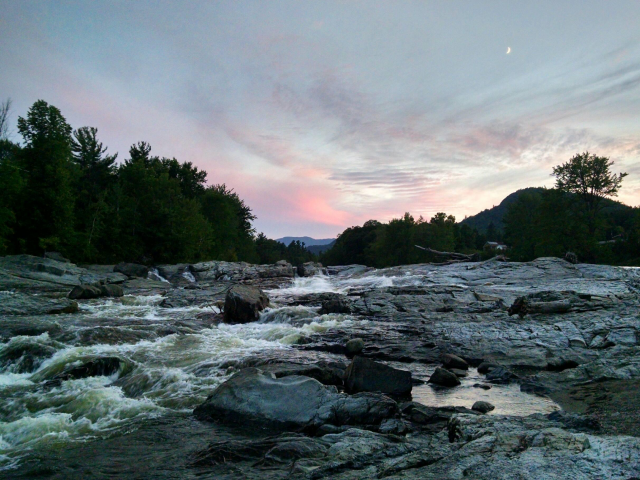 After asking around and doing a bit of research, I found one of the best-kept secrets in the Adirondack region – Jay Rapids. Jay Rapids is located in the town of Jay, about 10 miles north of Keene. Jay is one of three communities that make up the Township of Jay: Au Sable Forks, Upper Jay, and Jay. The township was founded in 1798, and was named after John Jay, one-time governor of New York State. With a population of little more than 2500, it’s a quiet area that is often overlooked by those interested in hiking the mountains. But for a quiet couple of hours alone, or with someone special, it’s a great spot to picnic, swim, and enjoy an awesome mountain view. The beach girl in me also enjoyed the idea that we might be able to catch a few rays while we were there, as well! Getting to Jay Rapids is pretty direct: It’s right off of County Road 82. From Keene, we took NY-9N/State Hwy 9N. Take that about 10 miles to County Rd. 82, turn right onto Glen Road/Mill Hill Road, follow that to the right (it turns into County Hwy 9R/N Jay Road). You’ll see the covered bridge and you’ll know you’re there. We parked in a tiny lot right alongside the bridge. It’s only three spaces (which lets you know right away you will probably not see many other people during your visit), and leads you directly to the rapids. There is also a larger lot on the other side of the bridge, but there was only one car there when we arrived, and we were alone in the smaller lot. 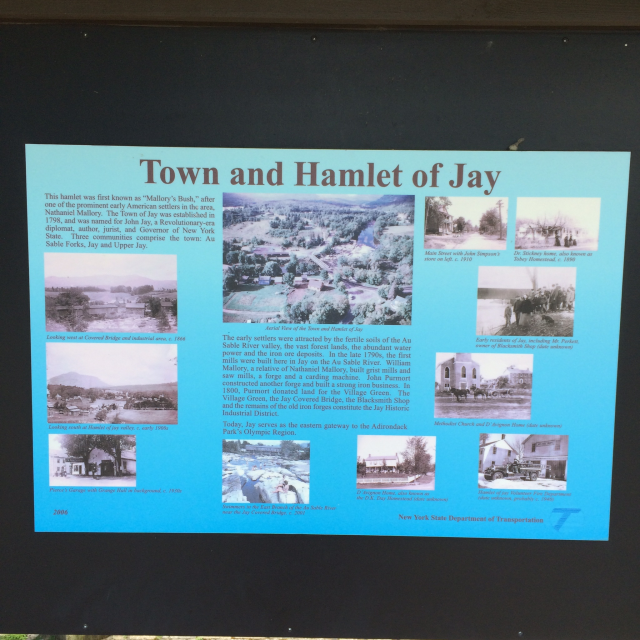 Once you get out of the parking lot, you’ll come across several signs and plaques that explain the history of the Town and Hamlet of Jay, as well as the various landmarks you’ll see. Once we parked, we walked down a steep little hill that led to flat rocks set along the river, the dogs running ahead of us to explore this new area. It had rained all morning, but now, in mid afternoon, the sun was peeking out and warming things up nicely. I heard the rapids before I saw them, since the water was running high because of the rain, and that made the rapids rough! The sound of the water rushing over the rocks drowned out the sounds of the birds, it was that loud! The Ausable River flowed briskly over the rocks, creating the rapids that the area is known for. It streamed between a lane of thick shade trees, and that created the peaceful and secluded feeling I felt from the minute I stepped out of the car. Even though we were only a short distance from the road, it felt like we were much more removed from civilization. The only thing that ruined that idea was the power lines that snuck into a few of the photos I snapped! I sat on a flat rock for a little while, enjoying the sunshine and watching the dogs play in the water, then decided to see for myself how warm (or cold!) the water actually was. There are several natural swimming holes at this point on the river. I made my way to one, picking my way over surprisingly unslippery rocks to ease into the water to cool down a bit. I was surprised at how warm the water was! I expected mountain rivers to be chilly, but really, the water was very comfortable for river water. There are also natural slides, formed from the rocks, leading from one swimming hole to another, but I wasn’t able to try that because of my knee. From stories I’ve heard, they can be dangerous, but exciting for those brave enough to try! Of course, always use caution in and near the water, especially water that is unfamiliar to you. The whole time we were there, we only encountered one other group - a father and his children - who went hopping from swimming hole to swimming hole. Otherwise, it was ours alone. It was amazingly peaceful, sitting there enjoying the company and the view, and a great way to unwind at the end of the day. 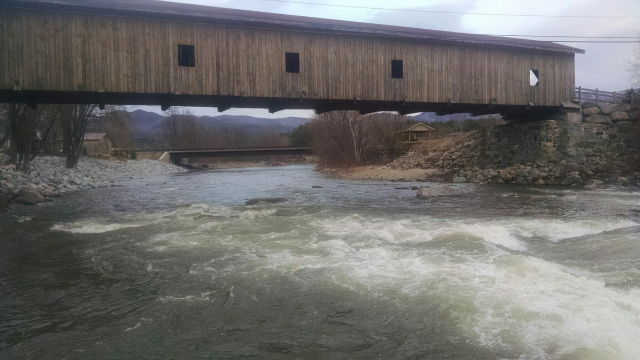 If you make your way to the town of Jay, you also need to walk through the Jay Covered Bridge (back where you parked), which, according to the signs, is the only remaining home truss bridge in the Adirondacks. 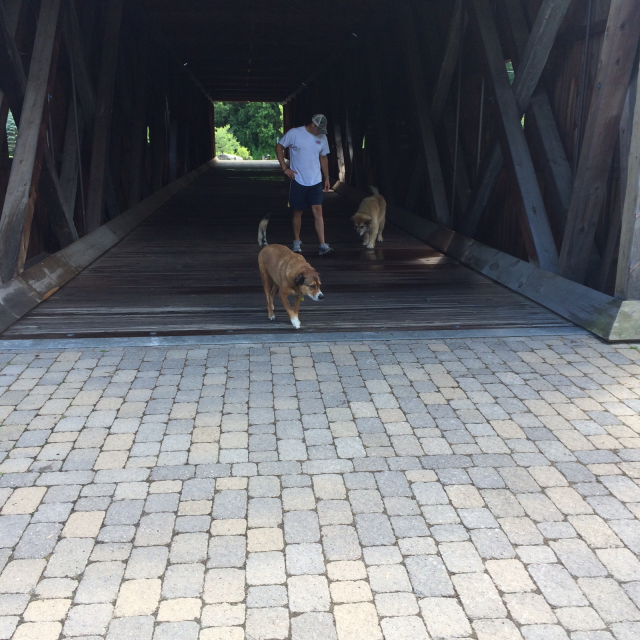 Just looking at it takes you back in time, and we took our dogs through it to experience a little bit of history. All of us enjoyed that, and I especially liked the little windows that are found throughout the bridge, providing a view of Jay Rapids from a higher elevation. I definitely recommend a visit to Jay Rapids this summer. You’ll find a beautiful, secluded spot that gives you the true Adirondack experience that can be enjoyed without much effort at all!